This black walnut desk is all original, with Country Sheraton turned feet. These more typically Southern desks were so designed that the top could easily be removed to a wagon and taken onto the plantation fields and to the outbuildings as needed to do work by the owner or the overseer. These were also used by Aide De Camps to write letters and complete documents for their commanding Confederate officers in the field. 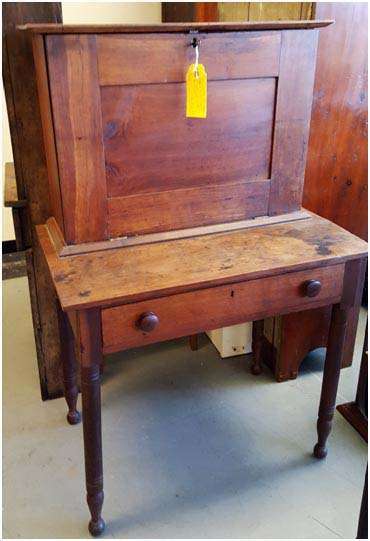 Having a relatively small footprint, this plantation desk is readily useful in today’s homes. Its tall stately look makes it a handsome addition to most decors.